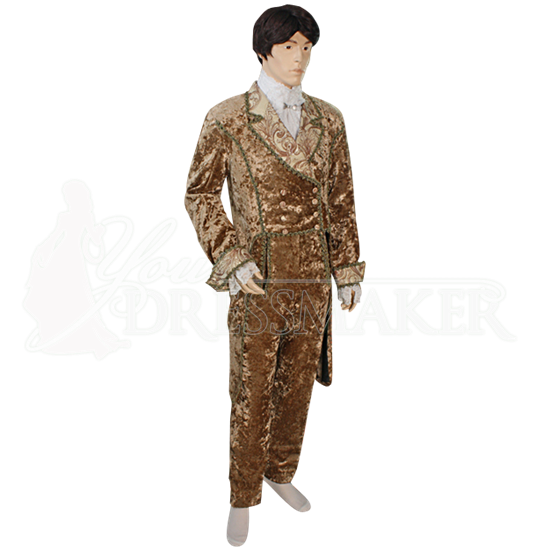 The Mens Crushed Velvet Dress Coat is a stunning take on Victorian fashion. Incredibly regal to behold, this reenactment coat is made from a shimmery velvet with brocade on its lapel and sleeve cuffs. Golden lace decorates each edge. Based on authentic historic styles, this velvet dress coat features a squarely cut away shortened front while the back of the coat remains long. A uniquely stylish addition to special occasion wear or reenactment costumes, the Mens Crushed Velvet Dress Coat makes a magnificent statement whether it is worn to sophisticated costume events, Renaissance festivals, or other historic reenactment occasions. This jacket is sold by itself, so coordinate it with the matching Mens Crushed Velvet Dress Pants (MCI-387) for a distinguished and impressive look. Wash gently with cold water and a gentle cleaning agent, using a half load on a short spin cycle. Water temperature should not exceed 85 degrees Fahrenheit. Air dry.